Greg Jennings runs with the ball during the Miami Dolphins' first OTAs of the 2015-16 season. Miami Dolphins wide receiver Greg Jennings likens his training to a state-of-the-art electric car: efficient and effective but thoroughly outnumbered by more traditional options. By incorporating specific CrossFit moves into his training regimen, Jennings looks to stay on top in the NFL. 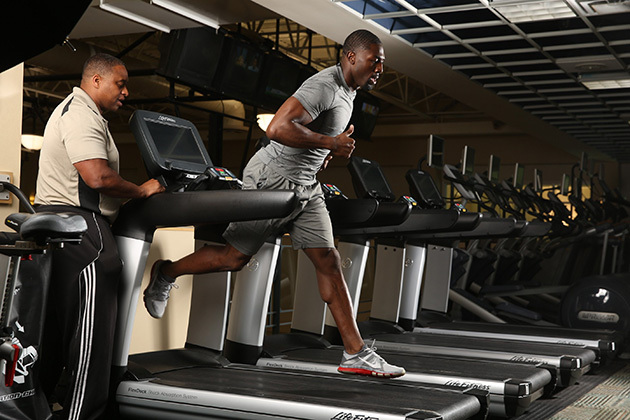 Greg Jennings likens his training to a state-of-the-art electric car: efficient and effective but thoroughly outnumbered by more traditional options. Without cords, plugs and power outlets, the Dolphins' wide receiver charges up his game with elements of CrossFit, a fitness company that has created and popularized a training philosophy that mixes components of plyometrics, gymnastics and powerlifting in intense bursts of multiple exercises. The workout applies the same Olympic weightlifting principles that are more common with his NFL peers. "I got away from a lot of heavy weights, but I didn't lose power," says Jennings. "With CrossFit training, I got stronger with less stress on my joints." Jennings, who played for the Vikings last year, was introduced to CrossFit by his trainer, Damian Harris, at the Studio Path in Kalamazoo, Mich., and he was immediately intrigued by the high ratio of work time to recovery time. "Your heart rate stays elevated and you work under pressure while being mentally and physically fatigued—it really worked for me," says Jennings. His high-intensity sessions include a combination of CrossFit fundamentals—burpees, kettlebell swings, box jumps, rope swings and more—repeated over a fixed time. Harris is also mindful of avoiding any exercises for Jennings, such as the clean and jerk, that could aggravate his prior injuries. ​"When everyone is tired, Greg should be gaining momentum and at his peak performance at the end of a game," says Harris. "We decided he needed to be lighter, faster and more explosive," Harris says. As a key part of the Miami's receiving corps heading into the 2015-16 season, Jennings also conditions his hands, both at home and in the gym. 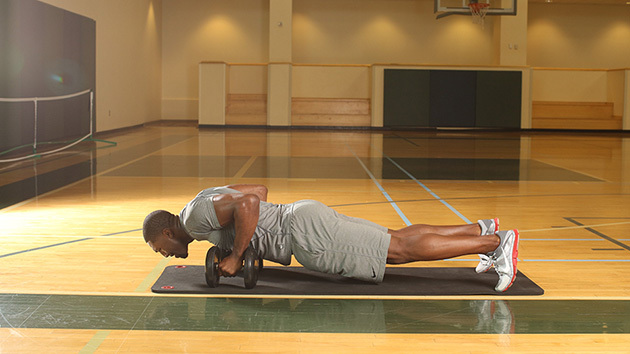 Entering his 10th season in the league, Jennings is aware of what methods work best for his body. Harris specifically strengthened Jennings's weaker areas, such as his hamstrings, which are susceptible to wearing out late in the season. The rapid-fire circuits force Jennings to control his breathing and focus on a task, be it a clap push-up or a sideline catch. His training is tailored to build fourth-quarter fitness, or energy storage for when other players run out of gas. "Everyone feels the weight of the game and gets fatigued," says Jennings, "but it's all about how you've dealt with it in the past and what you've done to help yourself overcome those mental barriers." Do 10 reps each of push-up side planks, burpee pull-ups, box jumps, squat thrusters and clap push-ups for as many rounds as possible over 20 minutes. 1. Perform a regular push-up with your hands on dumbbells. 2. Holding the position, row a dumbbell up to the side of your chest. 3. Shift your weight and twist, lifting the same arm until you're in a side plank. 1. Squat down, kick your legs out and lower your chest to the floor. 2. Jump up into a pull-up (use a pull-up bar in a gym or on a door frame) and get your chin over the bar. 1. Stand with feet shoulder width apart and at a comfortable distance from the box. 2. Explode upwards onto the box, swing your arms, propel upwards onto the box. 3. Try to land softly with your feet flat on the box, controlling your weight. 1. Lower down into a parallel squat. 2. Kick your legs back behind you into a plank position. 3. 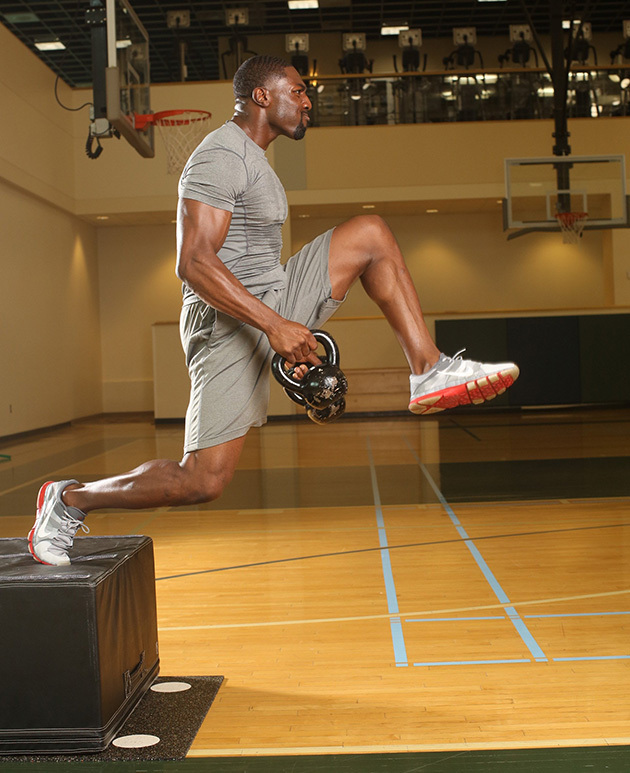 Return to standing, drive through your heels and jump up, pressing the weight overhead. 1. Perform a standard pushup. 2. Keeping your abs tight, shoulders back and feet together, explode upwards and catch yourself softly. Greg's record is 18 sets in 20 minutes—can you beat it? Working hard at the gym? Training for that first (or fifteenth) marathon? SI wants to train with you! Head to Twitter or Instagram, upload a photo of yourself getting fit and give us a little insight into why/what you train for. Include the hashtag #‎trainingwithsi and your photo could be featured in an upcoming issue of Sports Illustrated. Click here for Contest Rules.